When it comes to a battle system for this game, I cannot seem to settle on one. As soon as I get one established, I find another I would rather implement. Whether it’s because of simplicity, functionality, or just as an experiment, I guess I just love playing with different battle systems. The newest one I’ve decided to implement is Yami’s Symphony battle engine. Offering very similar features to the Tankentai battle system without all of the confusion, complexity, and compatibility issues that go along with it, it is now my favorite. While it is plug and play for basic functionality, the ability to customize every aspect of a skill and the accompanying animations for it made me fall in love with it almost immediately. Combined with the side-view format (which I personally prefer) I just had to switch to it. 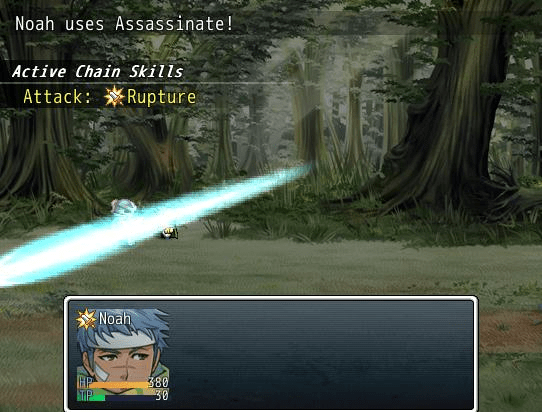 In addition there is an add-on script that allows me to replace the static enemy battler graphics with sprites. So now the battle doesn’t feel as visually awkward as most side-view battle systems where the players are sprites and the enemies are very detailed static images. Since I am avoiding random battles, I already have sprites for most enemies I will be using so there should be no lack of enemy diversity. Tagged Yami Symphony. Bookmark the permalink.